Our JUCA unit wound up being featured on NBC's Today Show in a very peculiar way. As best as we can re-construct it, it happened as follows. 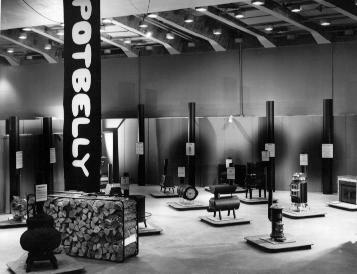 One of our wood-burners wound up in this Potbelly exhibition that was put on by the New York Hall of Science in Flushing, NY (near New York City). We have no idea how it was chosen to be exhibited. We certainly didn't approach them or pay to have it exhibited or even give them a unit. Shoot! We had never even HEARD of the New York Hall of Science at the time. They must have bought one from one of the nearly 300 dealers we had Nationally at the time. 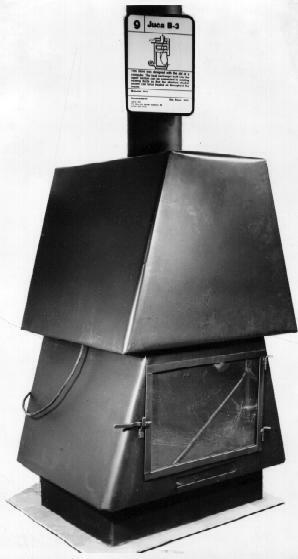 WE were certainly never told about it or even that there was going to BE an exhibit of Wood-Burning Technology. Of course, we're proud to have been considered one of a very few products with advancements so great as to show them in such an exhibit. But we didn't even know about it until after the fact. And even that was kind of weird. A number of owners of JUCAs saw that Today Show program. (None of us did!) Many called us after the show to congratulate us on such a publicity coup! We had no idea what they were talking about! Eventually, we came to understand that the Today Show had our product on (but apparently without identifying it as ours, so it had effectively no marketing effect!) And only THEN we came to find out that it was at the New York Hall of Science. (Wherever that was!) We managed to find a phone number for that museum, and they kindly sent us the two photographs you see here. You now know as much as we do about the whole matter! New York Hall of Science Potbelly Exhibition, Oct 10, 1980 to Jan 1981. We THINK our JUCA B-3 unit happens to be BEHIND the POTBELLY banner! It is HUGE compared to most of the other little things displayed! A month after this Exhibition began, the New York Times published a small article on the Potbelly Show on Nov 13, 1980. The text is presented below, where it does not actually mention the JUCA name, but it refers to our computer-assisted design as being attractive! The Today Show feature story was apparently aired after about a month of the Potbelly Exhibit being open, live on November 8, 1980, but, again, we didn't ever see it or even know it was going to happen! It tells you something about our marketing skills when even after such an Exhibit had been running for a month, we still had never heard of it! If we had, we might have known to watch for TV coverage! Several years later, out of curiosity, we contacted NBC's Today Show, to see if we might be able to get a copy of the segment. (Keep in mind that this was 30 years ago!) They said that we could buy a copy, but that they would charge us several thousand dollars for it! Worse, they said that it would be on two-inch-wide magnetic tape, and they said that they could not imagine how we would ever be able to view it! So we decided to not even try to ever see that Today Show coverage of our product!